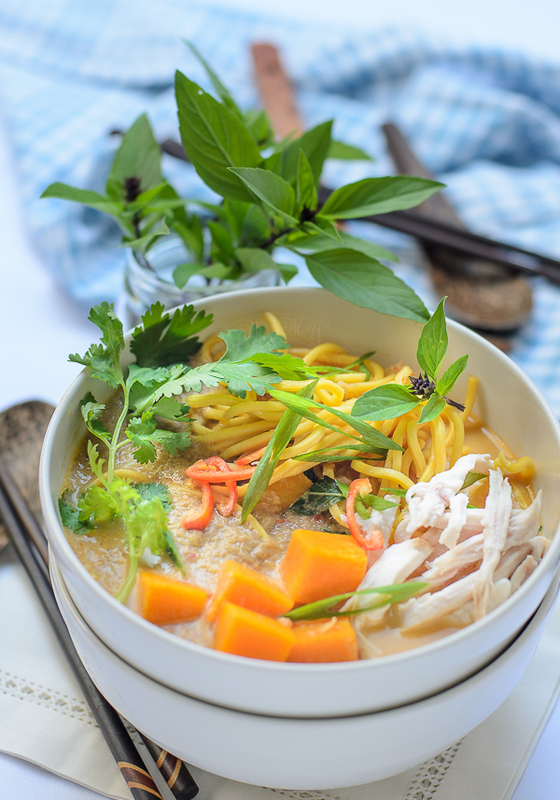 Noodle with Creamy Pumpkin Soup is a hearty creamy soup. 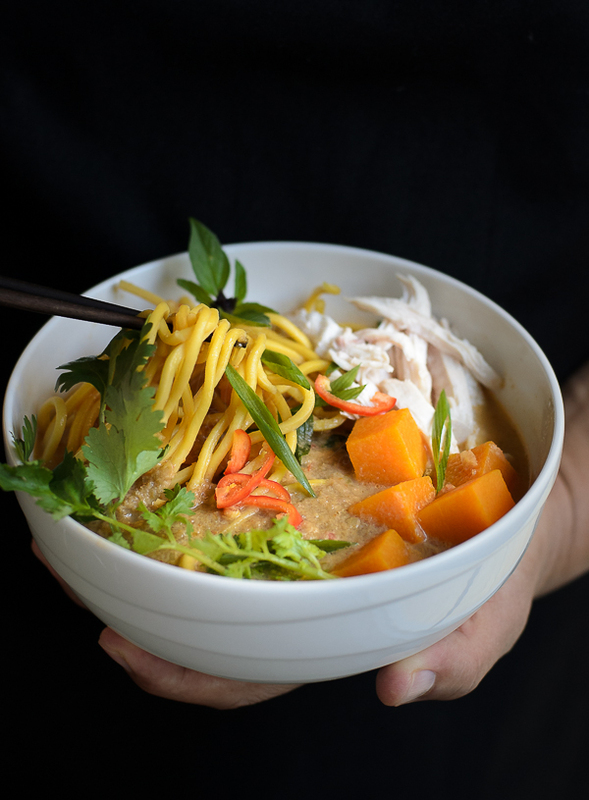 An excellent winter warmer 'pick me up' kind of meal in a bowl. I am surrounded by many shades of yellow, brown.... in every direction I look. Perth has always been brown (especially in hot summer months) and crisp ;P.
Do you have that 'feeling', that once temperature starts to dip, your cravings for pumpkin starts to kick in? I swear... my mind had been 'Pumpkin' programmed and it automatically switched on as mercury starts to dip ;P.
Put all that cravings together... you'll ended up with awesome bowl of goodness! in a food processor, combine dried shrimps, red onion, lemongrass, fresh chillies, dried chillies, shrimp granules, add a little water and blend into a smooth paste. in a medium size pot, Stir in the paste, chicken stock and water to boil, then reduce heat. Add pumpkin, fish sauce, sugar and pepper. Cook for 20 minutes until pumpkin is tender. Add coconut cream and bring it to 'just' boil. Stir in fresh thai basil. Serve with noodle and garnishings. A delicious combination! So comforting and flavorful. Never thought of combining noodleso and pumpkin, I like them separately. Looks delicious. 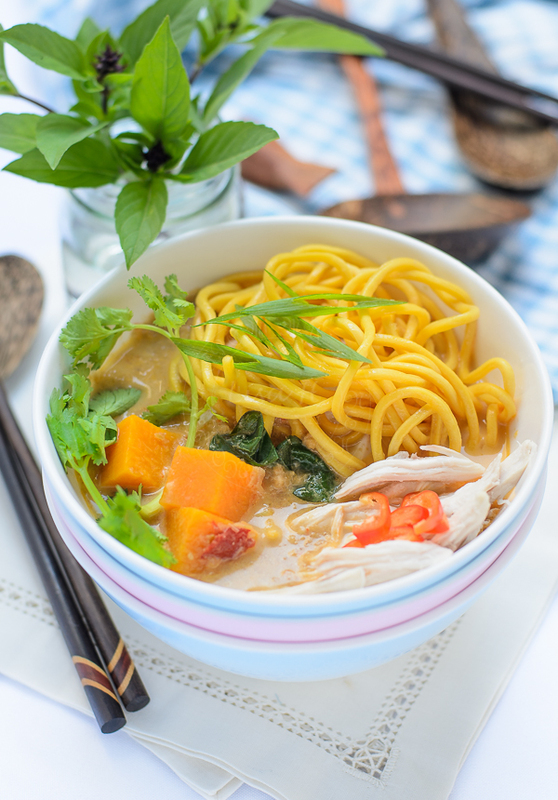 Perth's not looking all that brown Lisa, given we've finally had rain ;) The perfect dish for the current weather, and I love the idea of combining the pumpkin with the noodles. I crave creamy comforting pumpkin soup even when spring just arrives!! The noodle soup looks very tasty, Lisa. Thank you :D. I am lucky to be able to get pumpkin all year round. Lisa, this looks like a hug in a bowl!!! It has been cold the last few days hasn't it!!! We are south of Perth and experiencing chilly mornings, sunny days and rainy nights. Still at least the water tanks are filling up!!! And after the summer we had (I thought it went on forever!!!!!) I am glad of cooler weather and I am definitely glad of bowls of comfort food! This is beautiful! Can't wait to give it a go!!!!! It is a relief to have the change in weather... I too, thought we are heading for a long summer then skip autumn straight to winter. South of Perth is much colder than north, right? I am so thrilled (doing happy dance) to have 'met' 2 Perth bloggers in my virtual kitchen.